Scottish-born, Australian guitarist and songwriter. 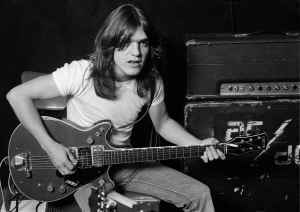 Young was a founding member of AC/DC but retired from the band in 2014 due to ongoing health issues caused by the onset of dementia. He is the brother of Angus Young, George Young, Alexander Young (2) and uncle of Steve Young (7), son of his eldest brother Stephen. A quiet one in the private, but the tour the force-rhythm train with AC/DC. Always at the back at the Marshall stacks with his '63 Gretch 6131with stripped pickups backing up Angus. The two just completed eachother creating the fiercest power-chord driven duo in rock history. Malcolm, we salute you and keep resting in peace!! thank you for the music. rest in rock 'n' roll!